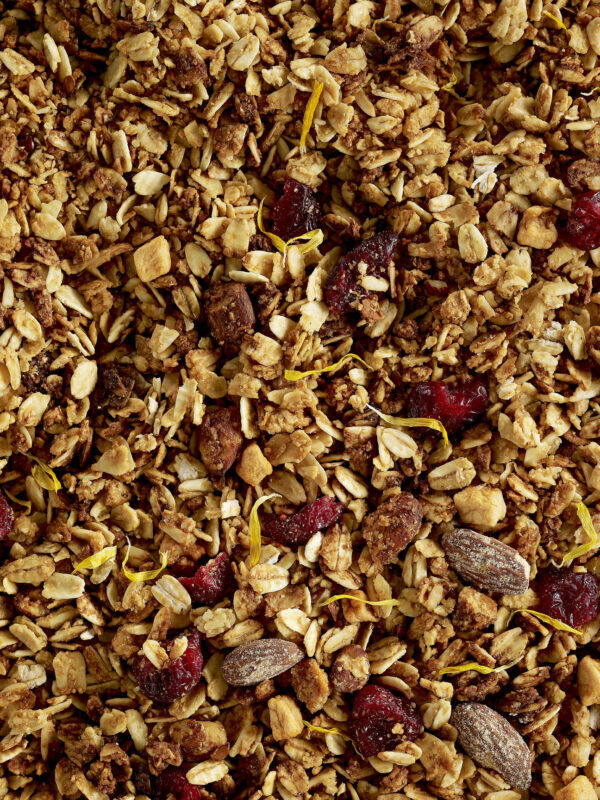 The Grand Granola Vitality is a perfect energetic breakfast to boost your mornings. 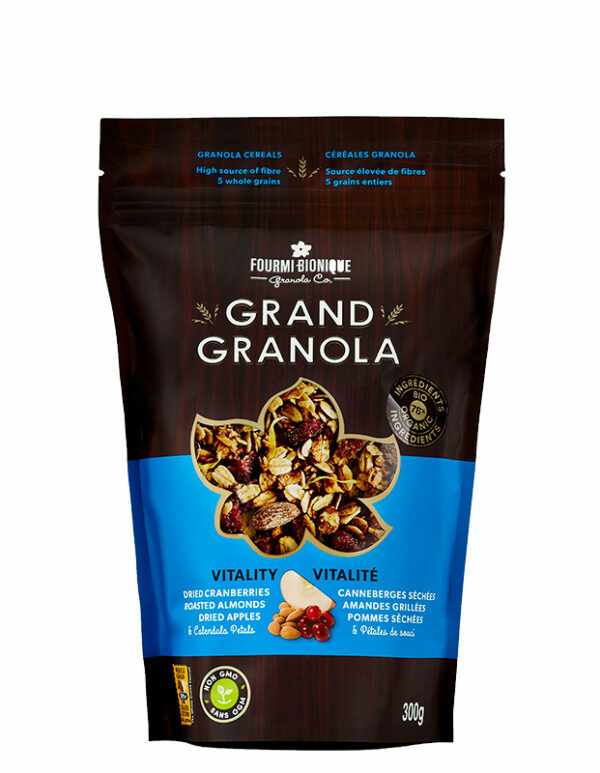 This wholesome, tasty and sustaining granola offers a very good balance between whole grains, almonds, caramelized apples, Quebec cranberries and organic calendula petals. A harmony of flavours linked by the sweetness of honey… Simply enchanting. A fruity and colourful granola blend thanks to the bright yellow petals and red cranberries that you can enjoy with milk or yogurt and fruit. See our recipe section for creative ideas! This product is certified by Ecocert Canada for it’s organic ingredients, Kosher Pareve by COR, and Whole Grains by the Whole Grain Council. 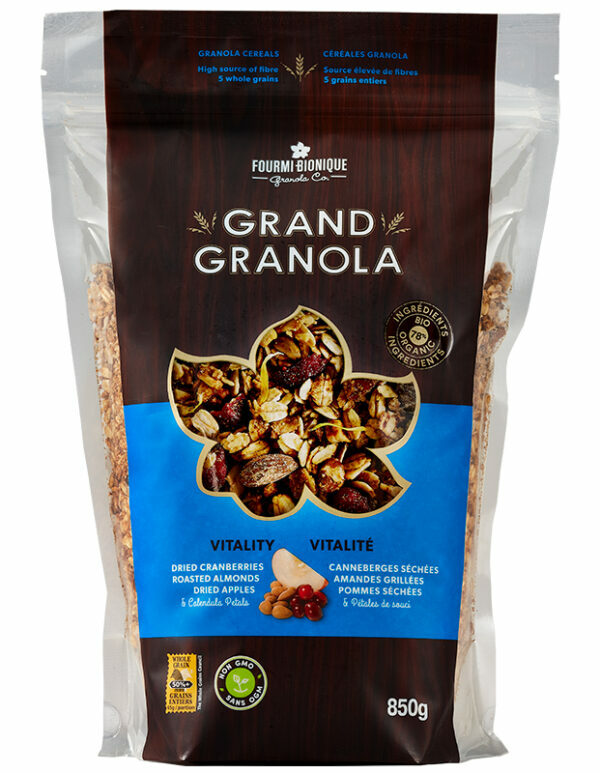 The Grand Granola Vitality is also available in an economic and recyclable bulk packaging. It is also offered in the NUTBROWN grain-free and gluten free granola range. Rolled oats*°, Sugars (honey°, cane sugar*), Whole spelt flour*°, Sunflower oil and/or Canola oil, Rolled rye*°, Rolled barley*°, Dried cranberries° (cranberries, sugar, sunflower oil), Oat bran*°, Tamari* (water, soybeans*, wheat*, salt), Coconut*, Almonds, Dried apples, Flax seeds*, Sesame seeds*, Cinnamon, Calendula petals*. May contain cashews, macadamia nuts, hazelnuts, pecans, milk and ingredients made in a facility that processes peanuts. Honey kissed and caramelized, sweet & tart fruits bow to the soft hints of sunny cinnamon and coconut. Playful and comforting, like a babbling brook intent on the moment.